Boise homes sales were hampered by record low inventory in 2018. At the same time home prices jumped again and reached new records. Last year we also began to see the first signs that the market may be shifting back towards balance, and many economists forecast that this trend will continue thru 2019. The average single family home price went up by 17% in Boise. The median price went up by 18% and the number of sales decreased by 4%. The substantial home price increases we affected by large number of new construction home sales that are usually priced higher. New construction sales made up more than 24% or 25% of the total sales in a given month, the overall median sales price was 12-14% higher than the previous year, on average. 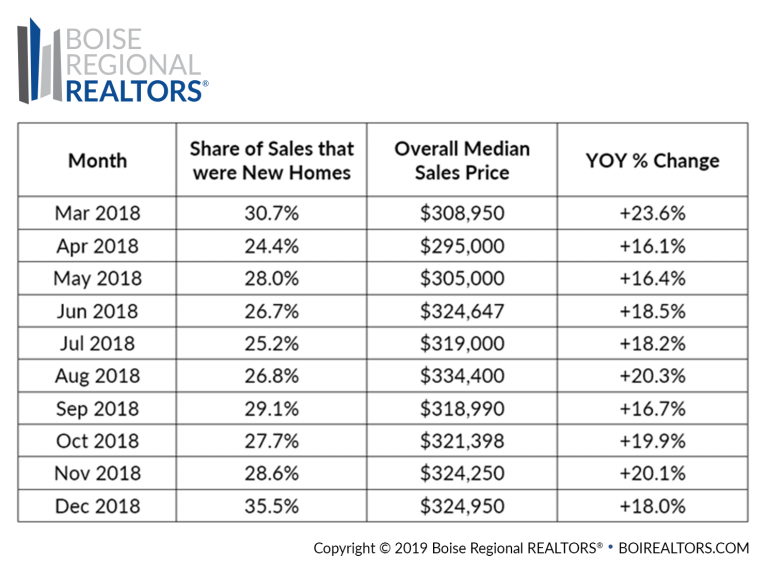 Since March 2018, every month of the year saw the share of new construction sales at or above that level, which had a major impact on the area’s overall median sales price. The median sales price for new homes has also been rising steadily, due to increasing costs of land, labor, and construction materials.